Once upon a time, TVs were big, bulky pieces of furniture that picked up three channels if you were lucky. Today they're sleek enough to mount on the wall of your Springs luxury apartment home and they can get hundreds of channels devoted to everything from sports to shopping. As if that's not enough, you don't even need a television to watch TV. Laptops, tablets and smartphones can all stream content on demand. Here's a look at where TV fits into our lives today (and maybe where it doesn't). 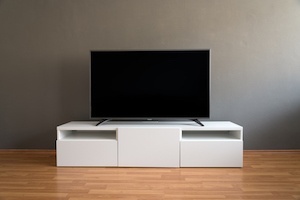 According to the most recent data from the U.S. Energy Information Administration, the average number of traditional TV sets per household has actually declined from 2.6 in 2009 to 2.3 in 2015. In addition, the percentage of homes without a TV set doubled to 2.3 percent, after holding steady at 1.3 percent for nearly 20 years. Not surprisingly, the younger you are, the more likely it is that you're watching content on alternate devices. TV use peaks with people aged 75 and older, while those 34 and younger have the highest use of smartphones. A survey by TiVo, the pioneering DVR company, found that U.S. viewers consume an average of 5.1 hours of TV content per day, which is the highest total of any country. But viewers between the ages of 14 and 33 are increasingly indulging in binge-watching, which is defined as viewing three or more episodes in a single setting. Gone are the days of planning your schedule to catch the big game or your favorite show. DVRs, subscription services and other options let you watch content at your leisure. Nielsen, the data measurement company that has been providing its iconic TV ratings system since 1950, created a new category to reflect this trend. "Time-shifted viewing" refers to any content watched up to seven days after its original airing. Does TV Watching Belong in the Bedroom? The bedroom has long been a popular place for TV watching. It's less likely to disturb others, and you can relax more easily. In a National Sleep Foundation poll, they discovered that 89% of adults and 75% of kids have at least one electronic device in their bedrooms, with a TV being the most common. But it's best to proceed with caution. Experts say that regular TV watching usually isn't a problem, but binge-watching can cause poor sleep quality. Limit your viewing time and use a timer when possible for automatic shut-off. You probably don't actually need anyone to tell you that too much TV watching isn't good for you. Make it a point to include other activities in your leisure time. Read a book, play with the kids or practice yoga poses in our 24/7 fitness centers. What's your favorite non-TV-watching way to unwind? Let us know in the comments!